These shades made such a difference in our kitchen - really brightened it up and the shades are proving to be of very good quality! Soften the light coming into your home with this classic bamboo Roman shade. 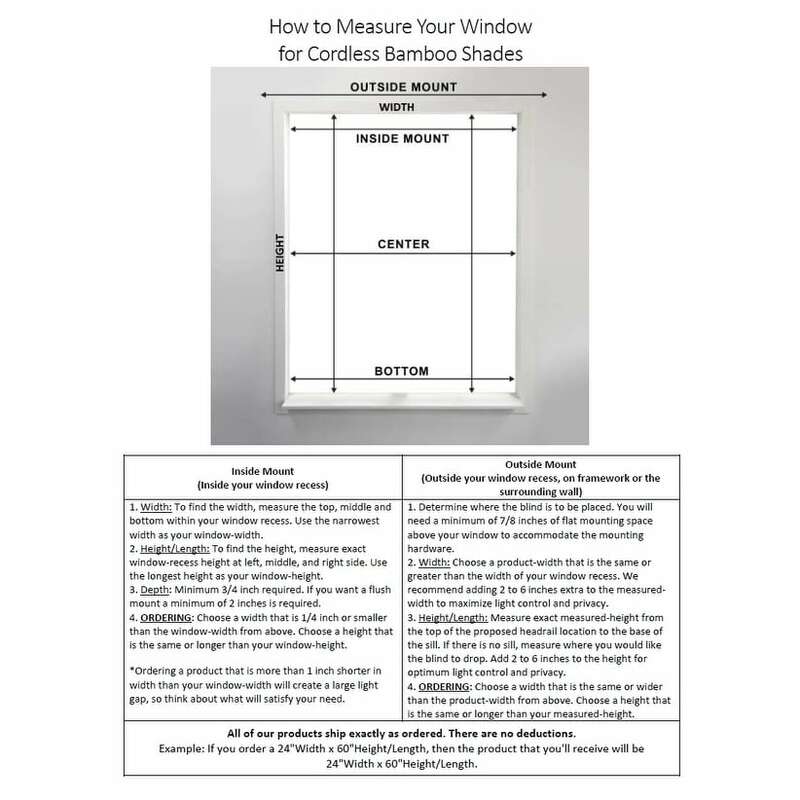 Available in multiple widths to conform to a variety of window sizes and constructed with sturdy bamboo, these light, and airy shades add a subtle accent to your decor and provide just the right amount of shade on bright days. The cordless design of this shade allows for simple operation and an uncluttered look and the versatile construction allows for both inside or outside mounting. This bamboo shade is intended for indoor use only. I love these shades! I gave them a 4 because I decided to hot glue the bottom bar up, so I couldn't see it when they were hanging. Also, because while they had a lot of sizes, none were exactly the right width for our set of windows. I got what I could and unless I tell people, hopefully it's not obvious. Positives: Install was really easy, just two screws. Depending on where I was installing I had to install the provided plastic drywall anchor. (Maybe to save you time I used a 5/32 drill bit for the anchors) I did the flush mount option. You don't have to be precise in your mounting of the brackets which was great. I love the color and light filtering they do for our space. This particular room gets blasted with sun and makes it not very enjoyable to play in or hang out in. Much needed and improved! Shipped with all the parts and pieces and none of the blinds were damaged. It comes with extra pieces for a return if you weren't flush mounting which is handy. I am thinking of making napkin rings with our since we don't need. ha! Beautiful colors, quality and easy to hang. I used two for my large window and it looks great! It is not a privacy shade. It’s a light filtering shade so if this is in a room that requires privacy sometimes then I recommend hanging curtains too. 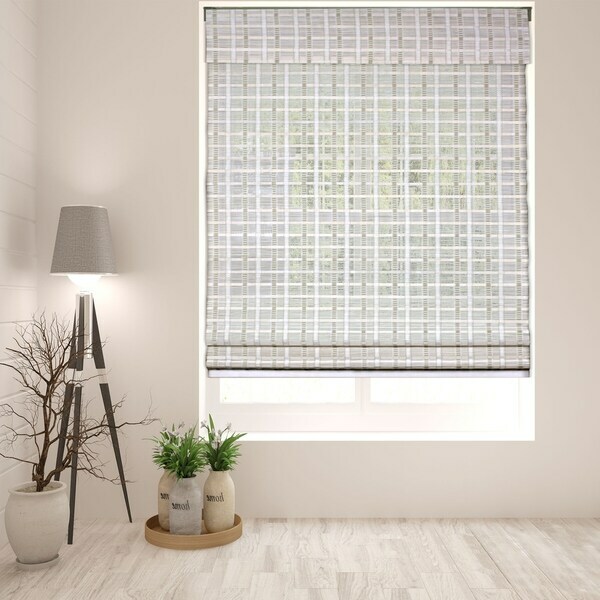 The cordless aspect of theses blinds are great!! Easy to install and to operate. Looks a lot more expensive than the price. Based on an online recommendation from a home decor blogger, I ordered six of these shades for our sunroom. They arrived quickly and were easy to install. They do allow some light to filter through, which is what we wanted. We've only had them up for about a week, but the shades appear to be good quality and the price was very reasonable. Would definitely recommend! These shades are beautiful and so easy to install. I love how they complete our windows. They are light filtering but still add nice privacy. I will be ordering more for the sunroom. 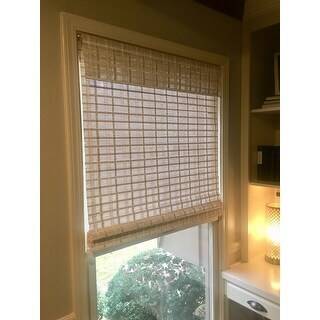 Absolutely love the Arlo Roman Shade! This added the perfect amount of warmth and texture to a kitchen window in our beach cottage. 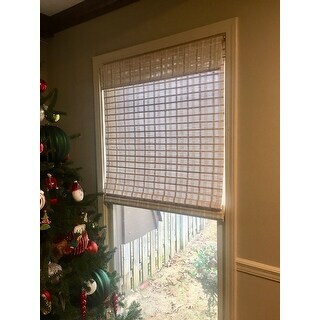 I absolutely love this blind. It is of great quality and the size matched perfectly to what I had ordered. 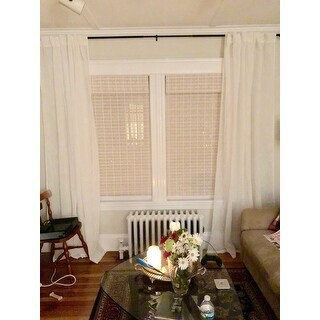 The blind was easy to install and came well packaged and with all the parts required for installation. The blind looks like a custom blind that would cost a lot more than what I paid. I would definitely recommend this product and this company. Modern yet still cozy. Perfect for a room where you still want light and minimal privacy such as a living room or kitchen. I wouldn't hang these in a bedroom or bathroom. Easy to install. The blinds seemed like quality blinds but I returned due to them being tan not gray. I have had these blinds for a couple months now, I’m waiting for my husband to hang them. I had been eyeing them for awh ile before I bought them I’m anxious to get them up. They are white with brownish green looking stripes. There are no instructions with them, they look like there made well. I would recommend. Amazing blinds! Love the look and color. Great blinds! Love the look they give our kitchen. Sturdy and easy to pull. Only reason I didn't give a 5 is because the slot on wood piece that attaches to bracket was not wide enough to insert. My husband had to saw each slot wider. Love them. Going to order 6 more. Loved these blinds, seem well made. Unfortunately I will be returning, I thought there was some gray in them but they are more white and tan and just don't go with my color scheme. "Anyone have a picture of the shades rolled all the way up?" "What are the largest width the cordless blinds are available in? Is there another style that comes wider...in white?" 45" is the largest width we have available in our cordless bamboo products. "I need these arlo bamboo whitewash shades in another size. Any idea whether you will be getting more of these???" "What is the projection from the window for an outside mount placement? My window has a handle on the outside that is 2” deep that I would like to cover with the blind." The overall depth of the shade from front to back when mounting is 2.25". However However, the shade portion hangs to the back, then there is a wooden headrail and finally at the front a flap valance of the same material. When raised, the shade goes up in a Roman style fold that can be anywhere from 6 to 10 inches in depth. If the door handle projects outward and toward the shade, then it may be hindered by the shade. If you are able to mount further in avoiding the handle, then it may not be obstructed. "How do I install the blinds? No instructions were included." "Will sizes above 45 inches wide become available again?" We are expecting more inventory by mid-March. "If mine measures 27 would I get a 26 or 28." This would depend on if you would like to mount your shades as an inside or outside mount. If you would like to mount as an inside mount you will want to order your shades approximately 1/4" to 1/2" smaller to account for mounting brackets and clearance.